I recently installed a set of used kitchen cabinets with an old friend of mine. He pulled out a small cordless drill and handed it to me to drive a screw with. When I finished, I knew I had to get a Makita 18-Volt Cordless Impact Driver . Never in my thirty years of installing kitchen and bathroom cabinets had I ever used a cordless drill that was as nice as this one. This review will be really short. All I can say is that if you want the best of the best, this cordless Makita impact screw driver is amazing. Those are just a few of the trades that can use this type of cordless impact screw driver. What totally blew me away with this tool is how light weight it is and the amount of power it has to drive a screw home. The compact design weighs a little over three pounds and is not quite six inches in length. It has a hex chuck for removing and attaching drill bits or screw driver bits. It truly is the easiest chuck I have ever used for switching out drill bits and screw/nut drivers. If you do an amount of work with a screw gun, this is a must have tool for your collection. It will make a great gift for dad on fathers day too! That’s just one of over thirty three reviews that people have written about this 18-volt LXT Lithium cordless Makita drill. Since I am a professional cabinet installer, I can only speak about how well this product works for installing cabinets. It’s got enough torque to sink a three inch long screw into a wood or metal stud with no problem. The Makita 18-Volt Cordless Impact Driver is a high quality tool to have for professional contracting work or for the “do-it-yourself” enthusiast. 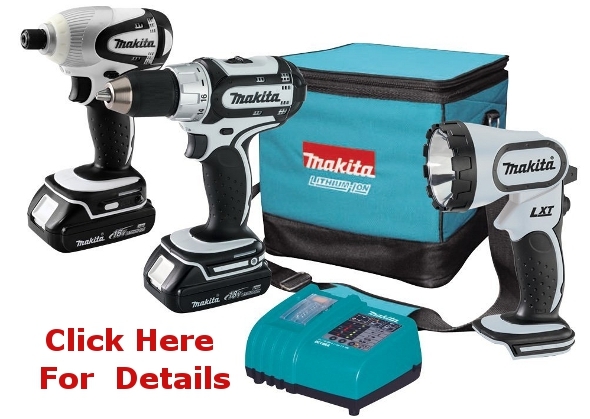 Makita has several combos available that include this particular impact driver. You can even get one that has a powerful flashlight in the kit with a canvas carrying case. I give it five out of five stars!